Not much cooking on my side yet. My new house has yet to really settle in yet. Getting through the kitchen still means climbing over bags and avoiding stuff clattered on the floor. Then the hall is half way packed too. Besides that, I have started joining a fitness centre, thus more time is spent going to classes and enjoying the last week of my freedom till my working life starts. I must do more cooking next week for it would be my last days of freedom. For now it is lazy days for me with ample time to enjoy my breakfasts. To think about it, I get to enjoy every other meal too, he-he. Another thing that is stopping me from regular blogging is that my new house does not have internet connection! Gasp! Oh well, all I can do is write first, save it and publish in J’s house. All in all for my love of food, writing and of course my dear readers. For now, let this lazy cook here introduce you to a place to eat, which I had gone to in my new neighbourhood. This place has one of nicest claypot lo shi fan (rat tail noodles). These noodles, if I’m not mistaken is made of rice flour, short, fat in the middle and pointed off towards both end. It used to be my favourite noodle when I was very young until there was a rumor that it has lots of preservatives which could be harmful and from there I had turn to like mai fun (rice vermicelli) more. but till now, lo shi fun is still my occasional pick for its special chewiness addition to the usual noodles. Before this I always ate it with cheng teng (clear soup) like those which Taiping is famous for, but when I came down to KL, I discovered the dark sauce and dry version of lo shi fun. 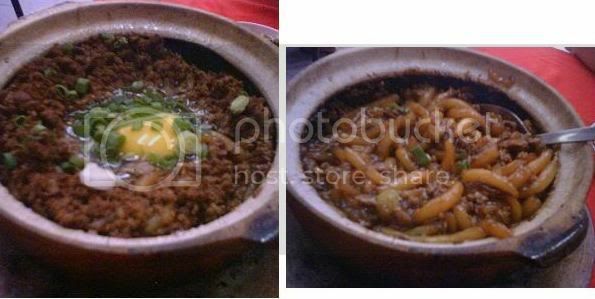 Till now I love the claypot ones best, as when cooked in clay, it imparts a special rustic flavour and keeps the noodles hot all the way. This claypot lo shi fun that is better than among all that I ate (except the one in Uptown, which sadly have shifted), was first introduced by my aunty. Then as now I have shifted nearby, I bring my 1984 housemate there one day. She once say that she love the one at Murni (SS2) but I was aghast! No way was Murni good, so I took her to this one to let her taste what real Chinese claypot lo shi fun taste like. It was less good than the last time I remembered it but it was still delish. I love the serving of the raw egg on top, cooking slowly in its heat. Once stir, it will coat the noodles nicely to a silky texture, which contrast nicely with the bite of the lo shi fun. 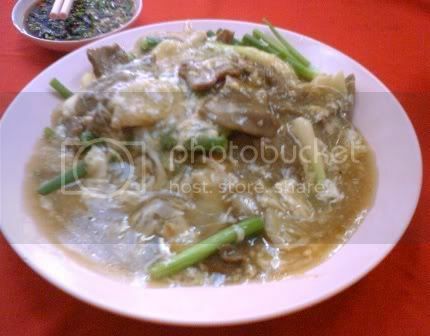 Besides this, we decided to try another noodle, and I was drawn towards this dish that has ginger in it. I love ginger in most things, even my tea, which we call it Teh Halia here at the mamakshor fun (flat rice noodle) with ginger beef. It was not bad too, with the beef soft enough and the ginger flavour just nice. Overall, although a bit pricey than the usual siu chow (literally for fry stuff) out there, the portion is big and the taste is great. Give it a try if ever you are in my new neighbourhood, which is TTDI. wat a nice neighbourhood u got there. wished i could be in one! FYI Mama's Kitchen is a branch of Seng Kee's Chinatown, a very famous makan place in Jln Sultan. TTDI is a pretty affluent neighbourhood with lotsa delicious places to eat eg, DJ, D Kim and not to mention Hartamas area just not too far away. Enjoy your new nest! Sounds like you're at the houses across the big monsoon drain from the TTDI commercial area! Yeah, Mama's Kitchen is yummy, always packed and the obvious choice when choosing a restaurant at that row. audrey, you're right, everywhere seem so near huh. boo, goo guess, being new i'm not so sure you're right or wrong, but i think i'm more on this commercial area side. dunno, I'm only guessing as the single storey terrace hses are across the monsoon drain, if not it's the double storey terrace hses after the petrol stations i.e. Petronas? boo, right one. double storey near the petronas! wow, my guess is so good. We often go around that area since we need to stock up supplies for the kitties at the pet shop.